. Our Slippers are perfect for pateints at risk of falling. The soft terry cloth keeps the foot warm whilst the latex-free rubber sole is non-skid helping to prevent falls, which means it is perfect for wearing throughout the day. 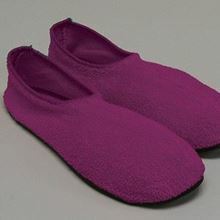 The bright colours that the slipper is available in means the staff can easily identify patients at risk. .
Soft terry cloth for the upper slipper. Colour helps care staff identify high fall risk patients. Available in Yellow, Red, Orange, Green and Purple. .
. Always assist patient on wet or slippery surfaces. Slippers are not intended to provide stable footing on wet or slippery surfaces, such as wet or slippery floors or shower stalls. Soles should be dry before allowing patient to walk unassisted. Wet soles will not grip firmly.